It all comes down to textiles, or the lack thereof. This is my new life philosophy. I will not explore the ethical or moral implications that could be associated with this philosophy, but rather a few economic and historical examples instead. We all remember learning about the Industrial Revolution in school – with the spinning jennys and flying shuttle looms that prompted the modern era of industrialization. Yep, that’s right: we developed based on technological innovation in textiles. Textiles also played an important role in the development of South Africa. In fact, seventeen year old Cecil John Rhodes was initially sent from his native England to join his brother on a cotton farming venture in Natal. Initially, he overlooked the potential for gaining riches in the diamond mines, believing cotton to be more of “a reality.” Of course, as history tells us, Cecil Rhodes eventually did give up cotton for diamonds, founding the now-infamous De Beers diamonds, which is now often criticized for monopolizing and price-fixing in the diamond industry. Of course, to stereotype Cecil Rhodes as solely a mineral magnate would be to do him a great disservice. A controversial figure, there is no doubt that he was driven by power, colonizing southern Africa in the name of the British Empire through extreme political maneuvering. 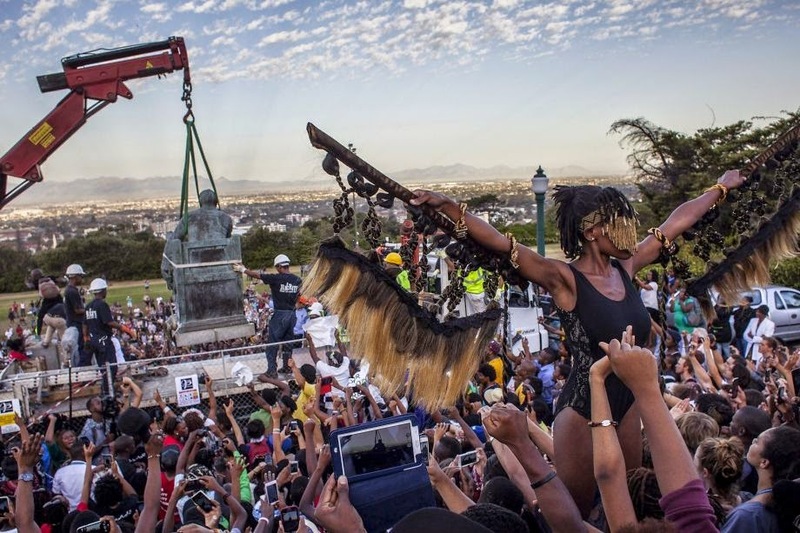 His legacy is mixed at best and was recently brought to light with the recent removal of his statue from the University of Cape Town, amid cheers from the student body after a social media campaign #RhodesMustFall, due to his racist legacy. 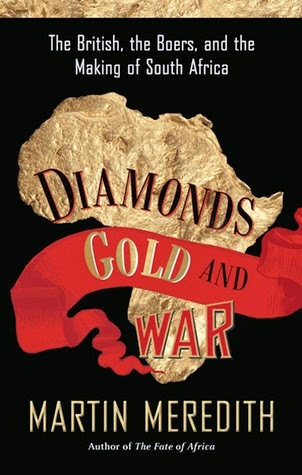 The legacy of Cecil Rhodes was outlined extensively in the second book I read about the country of South Africa, Diamonds, Gold, and War: The British, the Boers, and the Making of South Africa by Martin Meredith. To be honest, I got through this 500+ page brick out of sheer willpower, as I found reading about the Boers rather “boering.” That being said, I think that this is a book well worth the read for those interested in colonial Africa and the background from which the apartheid rule came to be. From the beginning, the British interest in the southern Africa region was strategic. At first, the motivation was to keep the region out of the hands of the French during the Napoleonic Wars. London thought the area “needed to be ‘maintained at all hazards and irrespective of cost.’ Strategic consideration overrode financial concerns.” (page 63) As the years progressed, so did the threat to British strategic interests. By the Boer War at the turn of the 19th century, the British were worried about the increasing power of Germany on the African continent, which London viewed as a natural ally to the Boers due to language and religious similarities. The Boers were resentful of British presence from the very beginning, believing that their communities’ individual autonomies were at risk. Their fears were exacerbated as they saw the British continuing to make changes to their unique ways of life. In 1834, slavery was abolished in all of the empire, which upset several Boer groups. At first, the Boers decided to not actively resist British growth. This was due not only to the increased economic prosperity brought by British development, but also to security concerns. As the British expanded, they demolished several rebel movements of the local Africans. However, by the end of the century, the Boers began to realize that they would soon be outnumbered by British settlers and without action they would soon by overpowered politically. The conflict boiled over in 1899 in the Second Boer War, which lasted until 1902. Initially believing that it would be a “tea time” war and would be finished within a few months, it caught the British completely by surprise and the Boers disbanded into small guerilla groups to attack the large British army. By the time peace was reached, instead of feeling victory, the British just felt relief. They had deployed 450,000 troops to southern Africa to fight against the Boers and 22,000 troops had died (the majority from illness and sickness, rather than combat. Although war costs were originally estimated at 10 million pounds, it had grown to over 217 million pounds. There was also a moral cost. In order to win, the British had engaged in scorched earth tactics and had even put many Boer women and children in concentration camps in order to squelch the resistance movements. After such a violent conflict, “the priority now was postwar reconciliation between the two white groups.” (page 465) This essentially meant that the indigenous Africans were overlooked, as the British conceded demands to the Boers. “While whites were engaged in their own political manoeuvres, the black population was relegated to the sidelines. Black hopes that British rule would lead to improved political rights and status were swiftly shattered.” (page 494) Reconciliation between the two white groups culminated on May 31, 1910, in which The Union of South Africa was created. It was within this new government that apartheid was ideated and bureaucratized. In the midst of this saga, we have the infamous Cecil Rhodes, making money and gaining increasing power by playing the British and the Boers off of each other. His political power culminated with being given a charter by the British government to expand the empire’s power into Zambesia, which in 1895 came to have his name and became Rhodesia. Ironically, despite all of the animosity he had created and the role which he played in the conflict between the British and the Boers, he died in 1902 at the age of 48 and did not see the results of the war. Often hypothesized to be a closeted homosexual and leaving no children, his last will and testament created the prestigious Rhodes Fellowship at Oxford University.